City Of Liverpool FC continued their efforts to raise mental health awareness with a talk featuring several notable experts. 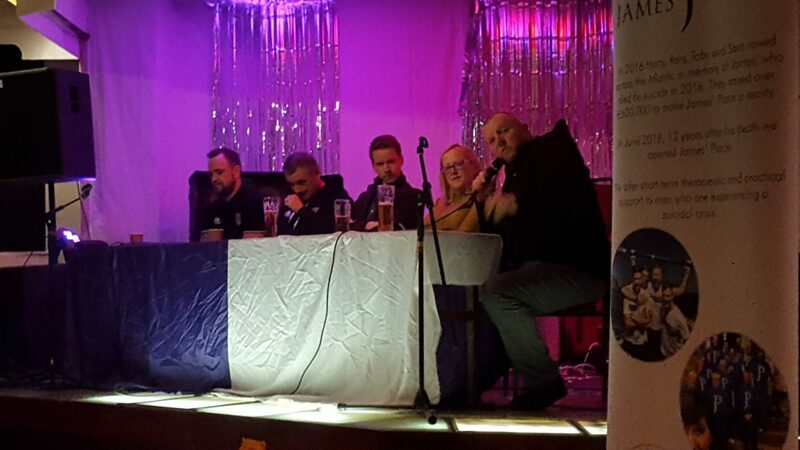 Former Rugby League star Danny Sculthorpe was one of the guests, alongside Dr Phil Cooper MBE from the State of Mind programme, Jake Mills of Chasing the Stigma, and Jane Boland from James’ Place as they formed a panel discussing mental health issues and prevention methods. James’ Place is a centre for men experiencing extreme depression and suicidal thoughts and fundraising for the charity took place both before and after the club’s narrow 2-1 home defeat to Silsden. Ms Boland explained: “Nights like tonight are vitally important. If speaking tonight doesn’t help someone here, it’ll help them help someone else. Panellists discussed their efforts through their respective charities and programmes before ex-England captain Danny Sculthorpe opened up about his own battles. He said: “I appreciate the opportunity to talk about my own issues with mental health. I’m fortunate to have the opportunity to possibly help someone understand they’re not alone and encourage them to seek help. City of Liverpool FC are not the only side in helping to tackle mental health issues, with Everton FC widely regarded as the club leading the way in this field. Comedian Mills has worked with Everton as a part of his Chasing the Stigma efforts. He said: “I’ve spoken to key figures at Everton, including Phil Jagielka, about how to approach helping people suffering with mental illness.